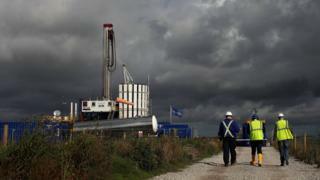 The Scottish government has announced an "effective ban" on fracking. Energy Minister Paul Wheelhouse told MSPs that the practice "cannot and will not take place in Scotland". He said an existing moratorium on the technique, which has been in place since 2015, would continue "indefinitely" after a consultation showed "overwhelming" opposition. The government will seek Holyrood's endorsement for the ban in a vote following the October recess. But with only the Conservatives now opposed to a ban, the vote is likely to be a formality. The move was welcomed by environmental groups but has been slammed by Ineos, operators of the huge Grangemouth petrochemical plant, which holds fracking exploration licences across 700 square miles of the country. The Scottish government has previously imposed a similar block on underground coal gasification (UCG) - a separate technique used to extract gas from coal seams deep underground - on environmental grounds. It followed the introduction of a moratorium on both fracking and UCG in 2015, which saw a series of expert reports published on the potential health, environmental and economic impact of the controversial techniques, as well as a public consultation being carried out. Mr Wheelhouse said the consultation came back with "overwhelming" opposition to fracking, with 99% of the 60,000 respondents supporting a ban. He said this showed that "there is no social licence for unconventional oil and gas to be taken forward at this time". The move comes almost exactly a year on from the UK government giving the go-ahead to horizontal fracking in Lancashire. Shale gas is currently processed in Scotland at a site in Grangemouth, having been shipped in from abroad, but cannot be extracted from beneath Scottish soil under the current moratorium, which is enforced through planning regulations. Mr Wheelhouse said local authorities would be instructed to continue this moratorium "indefinitely" - calling this "action sufficient to effectively ban the development of unconventional oil and gas extraction in Scotland". He said: "The decision I am announcing today means that fracking cannot and will not take place in Scotland." Mr Wheelhouse's announcement was welcomed by environmental groups, with Friends of the Earth Scotland and WWF Scotland both hailing a victory for campaigners. WWF Scotland official Sam Gardner said it was "excellent news", saying "the climate science is clear" that fossil fuels should be "left in the ground". Mary Church from Friends of the Earth Scotland said it was a "huge win for the anti-fracking movement" which would be "warmly welcomed across the country and around the world". However Ineos said the move could see "large numbers of Scottish workers leaving the country to find work". Tom Pickering, operations director of Ineos Shale, said: "It is a sad day for those of us who believe in evidence-led decision making. The Scottish government has turned its back on a potential manufacturing and jobs renaissance and lessened Scottish academia's place in the world by ignoring its findings." Ken Cronin of UK Onshore Oil and Gas also said it was a "poor decision", which ignored "extensive independent research" and was "based on dogma not evidence or geopolitical reality". And the GMB Scotland trade union said the move was "mired in dishonesty" and "an abandonment of the national interest", saying Scotland would now be dependent on gas shipped in from "the likes of Qatar and Russia". The Scottish Conservatives also said Scotland would miss out on a "much needed economic boost" and high-skilled jobs as a result of the decision. Tory MSP Dean Lockhart said ministers had ignored scientific and economic evidence to take a "short-sighted and economically damaging decision which is nothing more than a bid to appease the green elements of the pro-independence movement". However Labour MSP Claudia Beamish said the move did not go far enough, arguing that ministers were merely extending the existing moratorium which "could be overturned at any point at the whim of a minister". Ms Beamish has a member's bill tabled at Holyrood calling for a "full legal ban", but Mr Wheelhouse said this would not be needed until his proposals. The Scottish Greens said the announcement was "a step in the right direction". However, they also wanted a more permanent ban, with MSP Mark Ruskell saying the moratorium was "legally shaky" and open to challenge. This was also echoed by Friends of the Earth Scotland, with Ms Church saying ministers should "go further than relying on planning powers" and "instead commit to passing a law to ban the fracking industry for good". Scottish Lib Dem MSP Liam McArthur welcomed the decision, saying that ministers had taken the "scenic route" but had ultimately decided "effectively to ban fracking". MSPs have previously voted to support a ban on fracking, but SNP members abstained from that vote. The first is that fracking uses huge amounts of water that must be transported to the fracking site, at significant environmental cost. The second is the worry that potentially carcinogenic chemicals used may escape and contaminate groundwater around the fracking site.